Have yo been following the “green” trend with your meals? If not, it’s never too late to join the camp: Spring is almost here! If you look at the calendar long enough and pretend hard enough, you can almost feel it! Here is another quick dinner recipe. It is light, healthy, delicious, and yes, green. It can be easily customized based on what your family prefers: you can use spinach or kale instead of collard greens, use Italian sausage instead of kielbasa (or leave it out entirely). 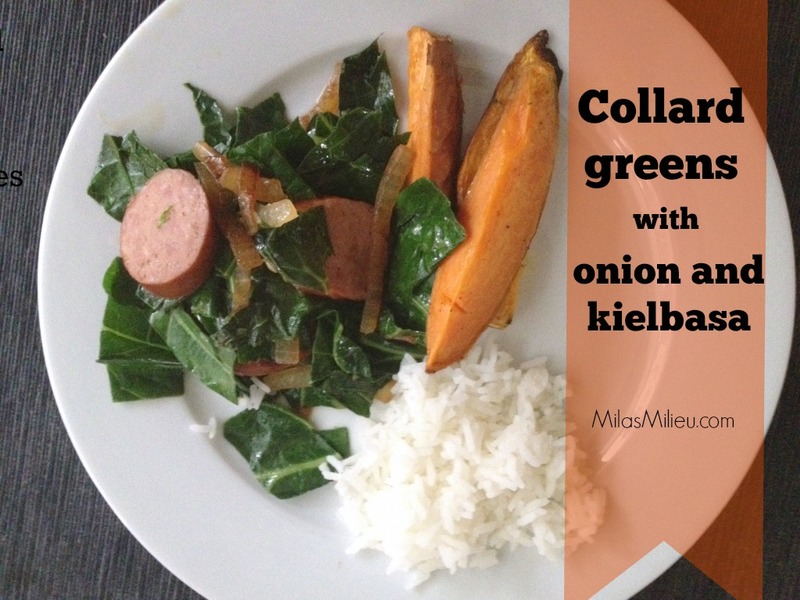 I must admit that I much prefer collard greens to kale in this recipe. We ate it with oven roasted sweet potatoes and rice. It was a perfectly balanced healthy meal ready under 30 minutes! Another proof to the “healthy in a hurry” concept. *Picky eater tip: when served with two sides that are popular with kids, they can easily pick what they like best from this variety: no need to make a special meal. 1. In a large skillet, heat oil over medium-high. Add onion and cook until softened, 5 minutes. 2. Add kielbasa and brown for 6 to 8 minutes. Add collard greens, season with salt and pepper, and cook, stirring constantly, until collards are just tender, 7 minutes. Stir in vinegar. Serve with favorite sides. To roast sweet potatoes: wash sweet potatoes thoroughly and cut into wedges (no need to peel– this is a quick dinner! ), dry with a paper towel. Drizzle olive oil, season with salt and pepper. Roast in a preheated 450 F oven for 15-20 minutes, stirring once. What is your favorite green leafy vegetable, and how do you like to prepare it? We love sweet potatoes around here, I need to try roasting them in the oven what a great idea. This looks like a great week night dinner.